Olympus E-500 Evolt SLR Review - Judging from both the size and price of the camera, the Olympus E-500 is meant for those who are new to the world of photography or are making the change from a compact camera to a D-SLR. The sheer amount of possibilities and settings offered on the Olympus E-500 however, clearly imply a camera for the more advanced photographer. This makes the Olympus E-500 a camera one can grow in to. It offers a great first step in to the FourThirds system, which will become even more comprehensive over time. We've had the opportunity to review the Olympus Evolt E-500 DSLR and the standard 14-45 mm lens extensively. Our test results can be read in our Olympus E-500 digital SLR camera review. At PMA we met Kazuto Yamaki, Chief Operating Officer, from Sigma Japan. 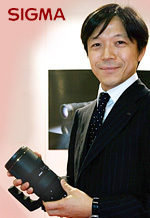 We took some time to set up a Q&A session at the booth from Sigma, and asked Kazuto Yamaki about Sigma's APO f/2.8 70-200mm lens, and the expected future developments of Digital SLR Lenses.